Former Virginia Governor Terry McAuliffe (D) has now flip-flopped his position on a highly controversial late-term abortion bill that was sponsored by a majority of Democrats during this year’s General Assembly session. McAuliffe called the legislation a “common sense bill” after distancing himself from it just one month ago. H.B. 2491, introduced by Delegate Kathy Tran (D-Springfield), would repeal restrictions on third trimester abortions, allowing abortion doctors to self-certify the necessity of late-term procedures, eliminate informed consent requirements, repeal abortion clinic health and safety standards, permit late-term abortions to be performed in outpatient clinics, remove ultrasound requirements, and eliminate Virginia’s 24-hour waiting period. During her presentation of the bill in a House subcommittee, Delegate Tran said third trimester abortions would face substantially fewer restrictions. “How late in the third trimester could a physician perform an abortion if he indicated it would impair the mental health of the woman,” subcommittee Chairman Todd Gilbert (R-Shenandoah) asked. Delegate Tran also clarified that abortion procedures would be allowed up until the end of a woman’s pregnancy. “I don’t think we have a limit in the bill,” she added. In response to a question from House Majority Leader Gilbert, Tran also suggested that partial-birth abortions would be subject to the bill’s repeal of existing restrictions on the procedure. “My bill would allow that, yes,” Tran affirmed. Upon further questioning, Delegate Tran explicitly addressed the hypothetical case of aborting a healthy infant, one week before the mother’s due date, on grounds of mental health. “I certainly could have said a week from her due date and that would have been the same answer, correct?” Gilbert continued. “That it’s allowed in the bill? Yes,” Tran said. 54 percent – a majority – of Democratic lawmakers sponsored Delegate Tran’s late-term abortion bill, in addition to Governor Northam, Lieutenant Governor Justin Fairfax (D), and Attorney General Mark Herring (D). Just days after the bill garnered nationwide attention, McAuliffe appeared on CNN stating that he would “absolutely not” support it when asked by host Jake Tapper. 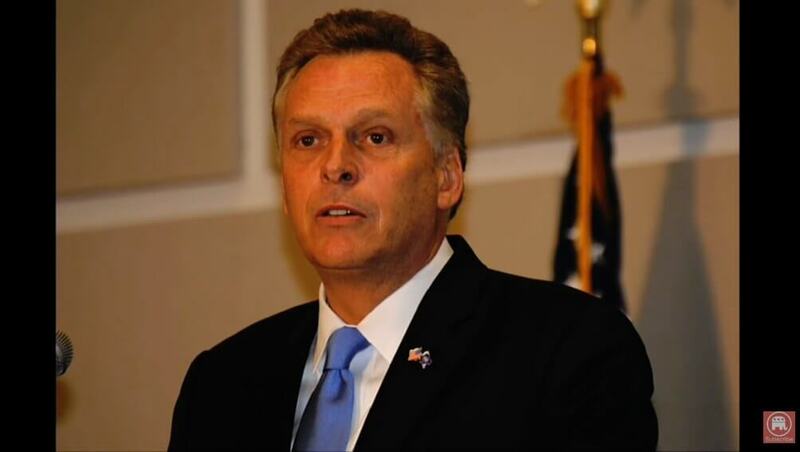 “Where we come from, it’s ‘life of the mother’ in the last trimester,” said McAuliffe. McAuliffe explained that the bill was not completely focused on expanding abortion access throughout an entire pregnancy, but rather that it sought to change the Virginia requirement stating that women must get the approval of three doctors before pursuing a late-term abortion. “This is very important. This is when stuff gets caught up in the political grinder,” McAuliffe said in reference to the outrage that ensued after Delegate Tran presented the bill and Governor Northam supported it the following day, also alluding to the support of infanticide. “If a mother is in labor, I can tell you exactly what would happen,” the governor responded when asked about the legislation. Upon further questioning, he described a potential scenario if the bill were to be passed by the state legislature. “The infant would be delivered. The infant would be kept comfortable. The infant would be resuscitated if that’s what the mother and the family desired, and then a discussion would ensue between the physicians and the mother,” Northam added, implying that the physician and mother would discuss whether the newly-born child should either live or die. In his interview on the “John Fredericks Show,” McAuliffe doubled down in his support for the abortion bill, explaining that disputing bills like Delegate Tran’s will hurt the Commonwealth’s attractiveness to women in positions of power.